This is the fourth book in the Frog Princess series by E. D. Baker. The series goes like this: A Prince Among Frogs, Dragon Kiss, The Frog Princess, Dragon’s Breath, The Dragon Princess, Once Upon A Curse, No Place for Magic, and Salamander Spell. In Dragon’s Breath, Emerelda, Eadric and Grassina go on a quest to save Haywood from ‘otter-hood’. On the way they face many challenges and threats. But something terrible will happen concerning a family curse and a grumpy old witch …! My favourite part is when they meet Ralf, the dragon, and fight the Giant spider, as frogs – I thought this was interesting and scary because I HATE SPIDERS! My favourite character was Ralf. Ralf is a dragon who is blue as well as being a young dragon prince whose grandfather is King Grumble Snort. I really liked how this book is a real adventure and not just a normal fairy tale where five minutes later, they get married! It also doesn’t have the usual gender stereotypes fairy tales have. I recommend it for 8-13 years old and I give it a 10 out of 10. Alice from the Queenspark Noses In Books group. Inheritance, the final book in Christopher Paolini’s Inheritance Cycle is released worldwide today. Reserve your copy at the library to find out how the series ends. Have you ever wanted to learn Dragonese, from Cressida Cowell’s books? In this video you can learn how to say to following things in Dragonese: ‘Please would you be so kind as to spit out my friend?’ and ‘I don’t like that. It’s revolting, it’s gross, it’s really, really revolting.’ Have a go and impress your friends. First there was Eragon, then Eldest, Brisingr, and now the series comes to an end with Inheritance. It’s released on 9 November 2011 and you can reserve your copy at the library now. While you wait you could read the first three books in the series. 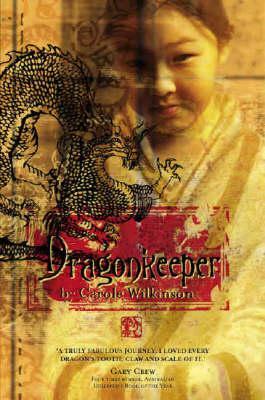 A book I have read recently is called Dragon Keeper which is set in china. It’s written by an amazing author called Carole Wilkinson who writes lots of cool books. This story is the first book in a series of four. It is about a young slave girl called Ping who is owned by a very mean man who looks after Chinese dragons and does the job badly. One day Ping allows the dragon to escape but it takes her with him. I am a girl and I really like this book but I’m not sure if boys would like it. This book has an awesome combination of Chinese history and fantasy. Compared to books like Harry Potter, I would give this book a nine out of ten.